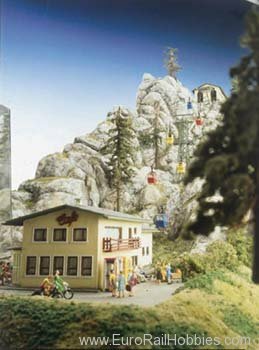 Set is complete with 2 yellow gondola's w/figures; 2 red gondola's w/figures; 2 blue gondola's w/figures; 1 Middle Mast Tower, bottom tower and top tower with motorized pulley, 10 meters cable. Note: This set can be properly finished with the Top and Bottom Building Stations, Kit # 6290. Motor operates at 14-16V Maximum DC Current Only.